Objective: Diabetic gastroparesis often fails to respond to medical management. 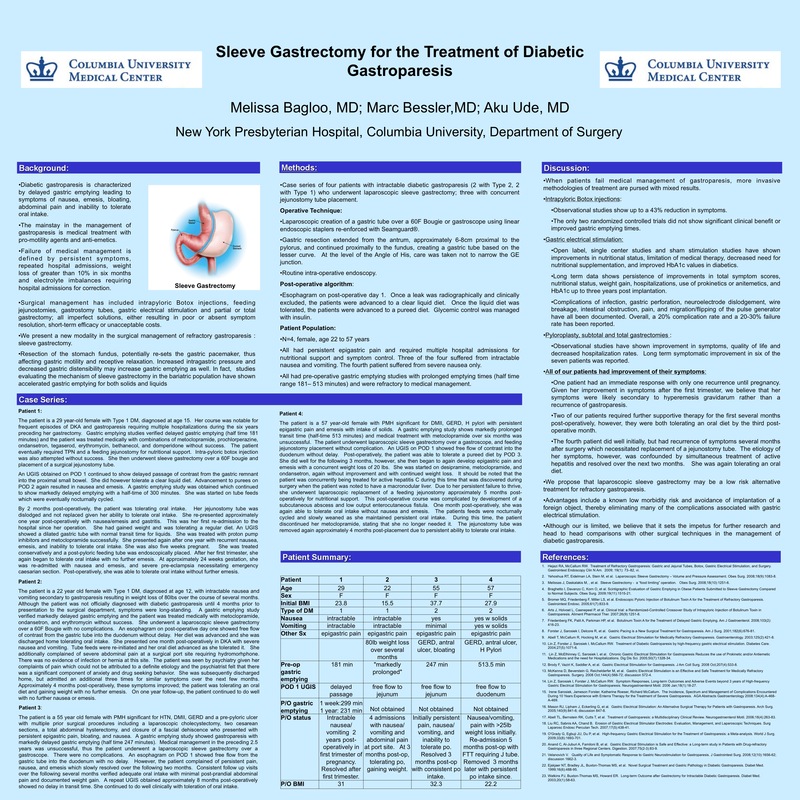 We present our initial experience with sleeve gastrectomy for the treatment of gastroparesis. Surgical treatment of gastroparesis with gastric pacing has shown some promise, but when this option fails, subtotal gastrectomy is often the end result. Evidence evaluating the efficacy of this is weak. Sleeve gastrectomy has been shown to increase gastric emptying in the morbidly obese. We present a series of four patients with diabetic gastroparesis who underwent sleeve gastrectomy with significant improvement in their symptoms. Methods: Four patients with diabetic gastroparesis (2 with Type 2, 2 with Type 1) ranging in age from 22 to 57 years underwent laparoscopic sleeve gastrectomy; three with concurrent jejunostomy tube placement. There were no complications. All patients were female, had persistent epigastric pain and required multiple hospital admissions. Three of the four patients suffered from intractable nausea and vomiting. The fourth patient suffered from severe nausea only. All patients had a pre-operative gastric emptying study with prolonged emptying times (clearance half time range 181– 513 minutes). No patients had improved symptoms on medical therapy. Only one patient had a surgical procedure prior to sleeve gastrectomy: a laparoscopic gastrostomy tube. Results: Three out of the four patients had significantimprovement of their symptoms. Esophagrams obtained immediately post-operatively showed thatthree patients had free flow of contrast from the stomach into the duodenum, while the fourth patient had delayed passage of contrast into the small bowel. One patient remained clinically asymptomatic for 2 years until her symptoms recurred in her 5th week of pregnancy. Two patients initially had persistent nausea and vomiting. However, with continued follow-up and patient education, their symptoms have resolved and both are now tolerating food per os. The 4th patient initially did well, however her symptoms recurred after 2 months, ultimately necessitating a feeding jejunostomy secondary to failure to thrive. Since this operation, she is now able to tolerate increasing amounts of food per os. Discussion: Three of our 4 patients had resolution of their symptoms after a minimum follow-up of 6 months. We propose that sleeve gastrectomy may be an alternative treatment for gastroparesis. Further study is needed to evaluate the potential benefit of laparoscopic sleeve gastrectomy in this patient population.